There is increasing understanding that schools can make a substantial contribution to student health and well-being, with emerging evidence that both the whole school environment and the ethos of schools need to be life affirming and health enhancing. Although the “core business of schools is to maximize learning outcomes”, creating positive healthy school environments should also be a priority especially given the positive correlation between the health of students /staff and educational outcomes. Healthy students learn better and well-educated individuals are healthier. Health Promoting Schools (HPS) is a whole-school approach that seeks to enhance both the health and educational outcomes of students through the learning and teaching experiences in schools. With the significant interdependence between health and education, HPS is a proven approach to improved health and educational outcomes thus achieving the core mandate of schools in a sustainable manner. In 2005 HPS was initiated in Nova Scotia as a partnership between the provincial health and education departments, the Nova Scotia Health Authority (formerly district health authorities) and school boards. This partnership has continued to work towards more collaboration and integration of initiatives in fostering healthy school environments across the province and in January, 2015 published a provincial guiding document that provides a good framework for HPS work around the province. In Luneburg and Queens Counties HPS work is led by the South Shore HPS team. This is a partnership between the South Shore Regional School Board (SSRSB), Nova Scotia Health Authority local public health staff (NSHA-PH) and the Regional Representatives of the Department of Health and Wellness – Active Living branch. This guiding document undergirds the work of the South Shore HPS team. 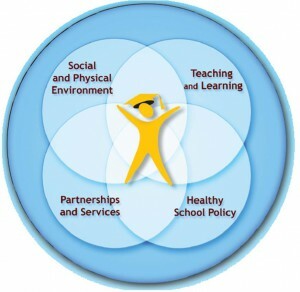 To ensure that HPS work is comprehensive and evidence based the local partnership (and provincial) has adopted the four interrelated pillars of the Joint Consortium for School Health (see figure 1 below) as a guiding framework for how HPS work will be carried out in school communities. When applied effectively, this lens (the pillars) helps planning at all levels. It is important to note however that not all pillars are required in a typical HPS plan but the pillars can be used to guide the work that takes place to ensure HPS work is comprehensive in scope. Applying or using more than one pillar in schools is highly encouraged. To find out more about SSRSB work in these areas, click on the tabs below.